Last week, I had the pleasure of attending Dreamforce 16 with my amazing wife. 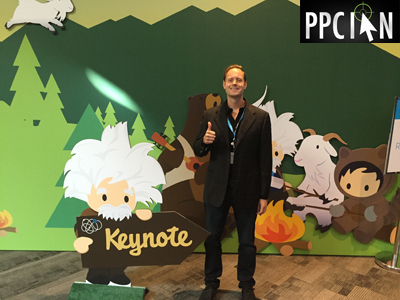 This was truly an epic conference, with many takeaways for marketers, salespeople, and businesspeople. Today’s post summarizes my big insights, and I’m hoping these provide actionable fuel for growing your own business. 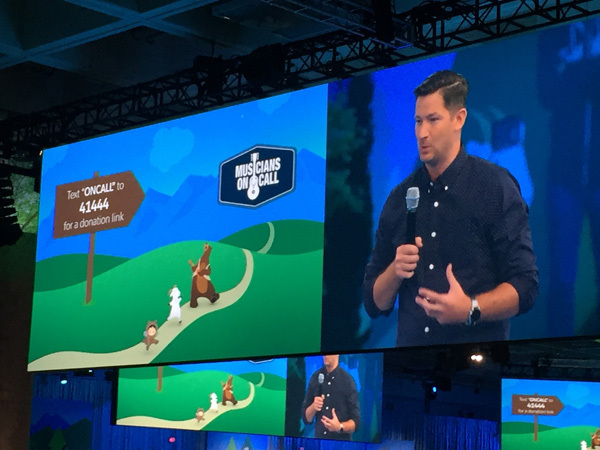 Before jumping into my blog post, I encourage you to watch my Dreamforce 16 video, taken live from the conference. And, when you’re done reading, don’t forget to check out the slides at the end of the post. 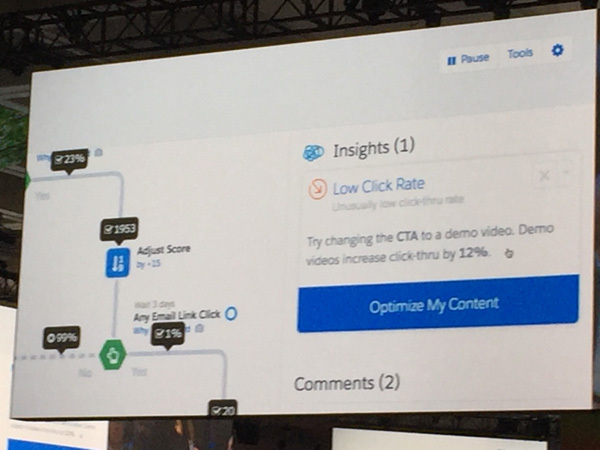 Dreamforce 16 was very much about the new Salesforce Einstein algorithm. Einstein is machine learning at its finest, an algorithm that learns over time and suggests tips to marketers and salespeople on how they can be more effective at their campaigns and jobs. Think of it this way: Einstein is like having a full time data scientist on your team, always looking for new optimizations and opportunities. 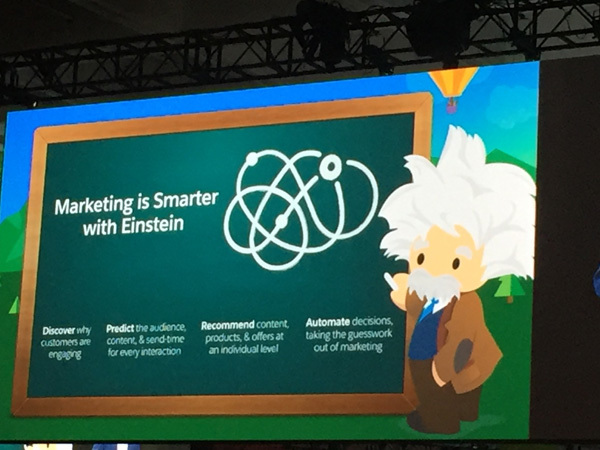 Rather than being a real person, Einstein lives within Salesforce. How cool! I’ve long been a fan of smart automation within digital marketing, and even wrote a whitepaper on the topic. Automation continues to evolve over the years and now spans departments. As you implement automation at your company think about how it can seamlessly tie together sales, marketing, customer care, product management, executive management, and others. Also, consider testing automation that learns over time, taking some of the heavy lifting (data analysis) off your shoulders. 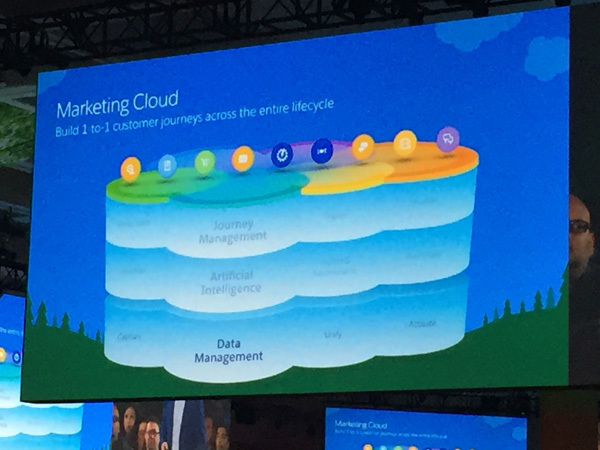 Salesforce demonstrated their marketing cloud technology, a highlight of the conference for me. As a marketing executive, I am the biggest fan of marketing platforms around. If your company already leverages Salesforce for CRM/sales, the case for auditioning their marketing cloud is quite compelling, especially if you are a B2B marketing organization. 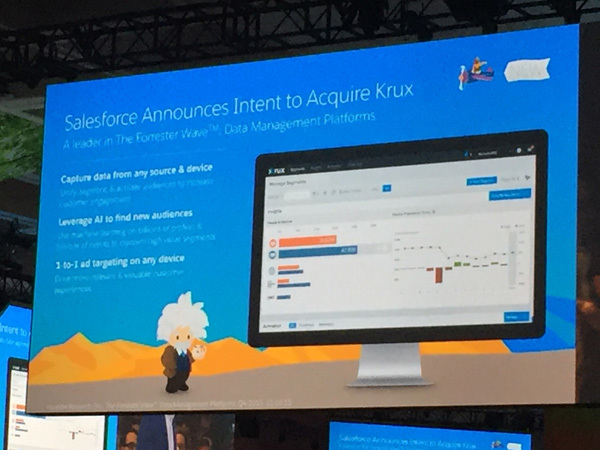 Salesforce is making it easy to leverage a unified technology stack that spans multiple departments. Audit your existing technology stack, if you have one. How would the new platform(s) fit into your existing mix? Would they replace existing platform(s) or complement? Understand your primary short-term objective. Do you need a platform that does it all, or do you want to start scrappy and address one opportunity at a time? Think about the long-term so the actions you are taking are scalable as your business grows. Consider the size of your business. Some platforms are better for different lifecycle stages. Understand your platform budget. Do you have millions per year to invest in technology or do you have a more limited budget? Go with the best! There are great platforms to fit all companies and budgets. When evaluating platforms, see how long they have been around and understand their reputation in the marketplace. Most marketers and salespeople agree that data is incredibly powerful. Data is the hub of any great business strategy. The challenge is data lives in so many different places. That’s why I suggest bringing a DMP (data management platform) into your company’s technology stack. Think of your DMP as the central repository of all your consumer data anonymized (both prospective and actual). Each of the solutions in your stack (and your CRM too) can tap into this DMP to gain insights and provide a better, more customized user experience. Practical use case: You sell autos. Someone visited a landing page for your lineup of SUVs. They leave the site. In real time, your DMP creates a record for this new prospect and also adds an attribute (they like SUVs). Next time, when the same consumer comes back to your site (maybe they just type in your homepage URL), the site taps into the DMP to personalize content. Of course, you choose a homepage image of SUVs, tailored to their interests. This is a very simple example, but you can start seeing the power of a great DMP. Make your DMP the hub of all of your marketing, sales, customer care, and website personalization. DMPs allow marketers and salespeople to connect 1-on-1 with prospective consumers. I really could not believe this statistic! How crazy is that? Salespeople spend the vast majority of their time engaging in activities that are misaligned with their primary role. I imagine this is quite frustrating for salespeople, and that they would rather be selling than working on administrative work. 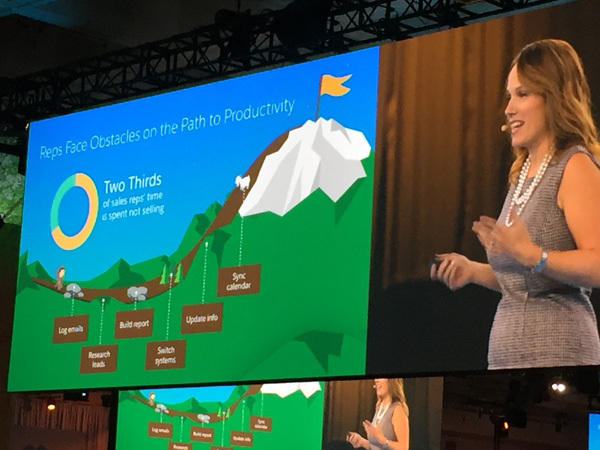 Of course, the charter of Salesforce is improving this situation and empowering salespeople to perform the work they love so much, automating and improving the manual work and administrative tasks that can consume valuable time. At a meta level, I imagine this statistic is not too far off for other professions. My insight and takeaway here is to always remember my primary goals and focus, focus, focus. There are so many distractions out there. There are so many administrative tasks. How can we all get better at focusing on the activities that produce great value, finding alternate ways to get the manual work done? 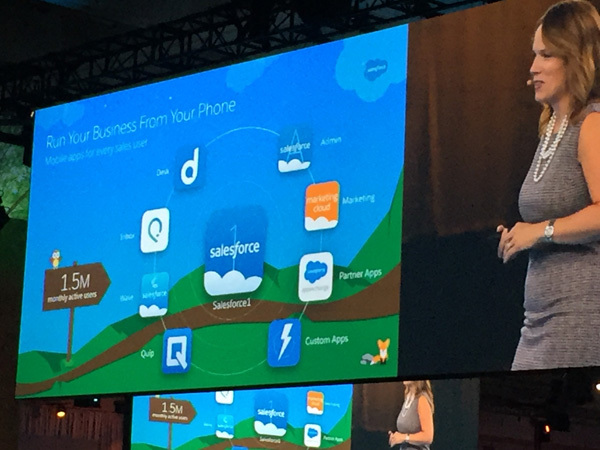 I thought this was really neat: Salesforce allows you to run your business from your phone. With the married marketing and sales clouds, you can do so much on the go. I’m a big fan of the mobile lifestyle, and find so much inspiration when I’m working from all different kinds of places. In fact, I personally get more done when I’m not in the same environment every single day. My big insight here is that we should all challenge ourselves to be more mobile. What can we do from our phones? How can we all visit different places and get really creative with our work? When it comes to charity, Salesforce is a company I admire incredibly. They take charity so seriously, and invented the 1-1-1 integrated philanthropy strategy. Under this model, Salesforce (and other companies that choose to participate), donate technology, time, and money to great causes. At Dreamforce, I had the honor of learning about Musicians On Call, a charity that brings happy moments (via live music) to those sick and stuck in the hospital. I’m a big believer in the power of music, and have been actively looking for charities in the space. We’re already donating to the Fender Music Foundation, a charity that provides musical instruments to schools and students that cannot afford them. Now, we have started giving to Musicians On Call as well. I recently wrote a blog about focusing on activities that will drive value 50 or even 100 years form now. Charity is one activity that cannot be underscored enough. My big insight here is that we should all find ways to give back. Giving back should not be a secondary objective, it should be a primary objective in our lives and businesses. Let’s all get out there and add value that will live on forever. 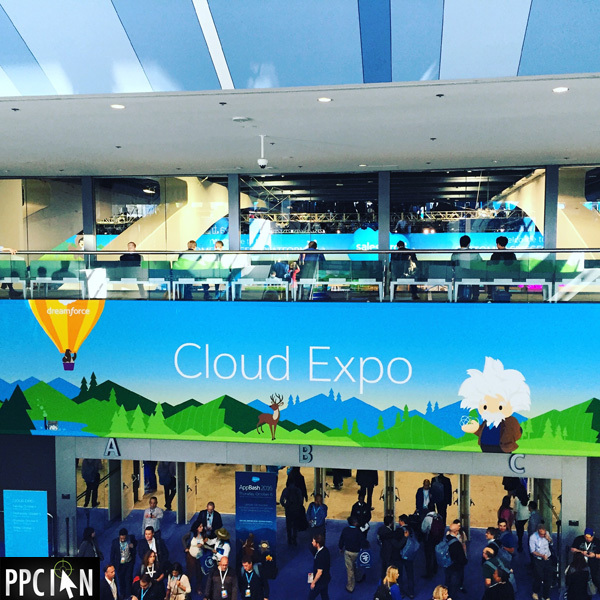 Running concurrently with Dreamforce, we also attended a nearby event called Open Lounge by InsideView. I especially enjoyed watching the EverString presentation. 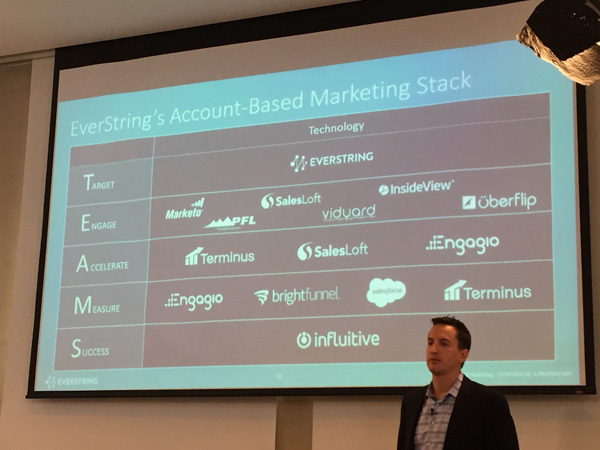 My big takeaway from this event is the growing popularity of Account-Based Marketing. Many marketing teams have focused on "generating leads" from a lowest CPA (cost per acquisition) standpoint. Leads come in and then they go to the salespeople. However, salespeople have historically approached things differently. They look at the universe of potential customers and cherry pick the most important ones. They double down on the accounts that matter the most. Account-Based Marketing aligns marketing with the sales worldview. It enables 1-to-1 marketing. When an account has been identified, sales and marketing work together to acquire that specific customer. This involves a lot of collaboration and technology, and naturally makes sense to me. In fact, I have been practicing account-based marketing for a number of years, before this new term was coined. The insight: Find ways to collaborate and support your sales team. While inbound leads are great, don’t lose sight of the big picture customers. So there you have it, a few of my favorite insights from the conference. 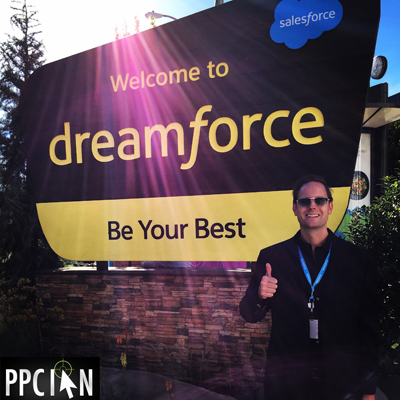 If you attended Dreamforce, please feel free to share your insights in the comments! Images of Ian Lopuch – Copyright © PPCIan.com. Images of slides – Copyright © their respective creators.